The front of your house creates the first impression before you walk in, which is important whether you’re prepping to sell or settling down for years to come. Without changing the structure of your house itself, these front of house landscaping ideas can help you transform your home’s curb appeal. Illuminate a walking path or feature. 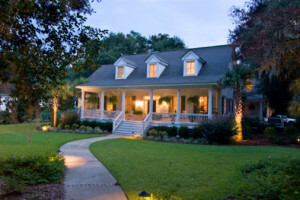 Lighting the pathway to your home makes it safer and cozier. Many garden stores sell easy-to-install lights on stakes which can be planted in the ground. Solar-powered lights charge during the daytime and won’t require any wiring. If you need a brighter light source that will require wiring, they can easily be programmed to turn on and off automatically with a daily timer. Lights can also be pointed upward to highlight beautiful trees or features on the front of your home. Create a container garden. Gardening stores offer a wide variety of already potted flowers, shrubs, and trees, which can easily be coordinated with your existing yard. The best part is that you can easily rearrange them to create a different look, for example in an ordered geometric pattern or an asymmetrical cluster. Add floating flower arrangements. Window boxes and hanging plants can also spruce up your porch. For a different approach, you can also add flower baskets to fences with steel supports. Create a new border for your planter garden. This can be as simple as washing and resetting old bricks and pavers. If you’re choosing a new border entirely, try to match the style of your home. When in doubt, natural stone provides a classic look. Adding new mulch can give a flower bed cleaner looking edges and a vibrant color contrast. If the plant doesn’t require a lot of water, like a palm tree, experiment with gravel or stones instead of mulch. Makeover your fence and gate. If wood, paint or stain the surface to match your home. Another option is a wrought iron fence with stone or concrete posts. This style of fence adds light to your front yard and shows off curb appeal while still keeping the entrance secure. Wrought iron fences also come in a wide variety of styles and geometric patterns. Add a fixture for a grand entrance. Pathways can feel much more dramatic when you walk under a garden arbor (a rounded structure) or trellis (rectangular). These can easily be purchased ready for assemblage at garden and hardware stores. Once in place, they can also be further decorated by training vines or incorporating light fixtures. Create a focal point. Fountains, sculptures, bird baths can be a beautiful addition to an otherwise plain front yard. Water features have the added benefit of cooling their environment on a hot day. If possible, place water fixtures out of range of dropping leaves. If traditional sculptures found at a garden store don’t suit you, consider looking for modern pieces at local art fairs or markets. Creative metal cutouts are easy to find and their rusted color pops against green lawns. Add hedges. Depending on how you groom them, hedges can add a vastly different feel to your front yard, from pristine to wild. They’re also easier to install than trees while still providing privacy and definition to the borders of your yard. Landscaping is essential for the look of your home. For more landscaping ideas, read some of our helpful articles on our blog. We provide plant installations, stone work, and design to help you achieve the look that suits your home. Feel free to contact us with any questions or to request a free consultation from Greener Horizon.